Sebastian Vettel says any Formula 1 fans hoping for an excitement fix by watching the World Cup will find that entertainment will be similarly fickle at the football showpiece. 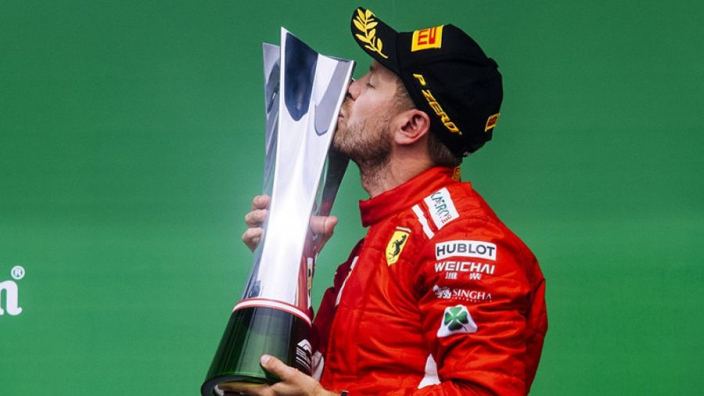 Vettel took top spot in the drivers' standings with victory at the Canadian Grand Prix, however the Ferrari man's triumph was not a thrilling spectacle. After qualifying on pole in record-breaking time, Vettel controlled the race superbly, leading every lap en route to his third win of the season, which now puts him a point ahead of Lewis Hamilton, who could only finish fifth. F1's big six drivers all finished in the top six, although Daniel Ricciardo was the only one to make any gains, jumping Kimi Raikkonen off the line and then overtaking Hamilton in the pit-stops. Montreal's reputation for action subsided as drivers seemed to focus more on preserving tyres and engines, a common theme in F1 this season amid tight power unit regulations. The season-opening Australian Grand Prix prompted an overhaul in the aerodynamic rules for 2019, while the Monaco Grand Prix a fortnight ago was followed by calls to remove Monte Carlo from the calendar after a similarly soporific affair, although Vettel has warned against taking drastic action. "Life's like this, or racing. Racing's probably like this," Vettel said. "I don't think it's justified to criticise the racing, or criticise this race. I don't know if it was boring. "From my point of view, obviously, it's still busy inside the car no matter where you are but I don't know why people today are so short-sighted. We had seven races this year, I think some were phenomenal, some were boring. "But next week the World Cup is starting and I promise you that a lot of the games will not be exciting – but still people will watch it – but some games will be incredible. "That's what we always look forward to – but it can't just always continue to go up and get better. "I think we do our job inside the car and if we can race, we race but obviously, we also do our job inside the car and try to avoid racing. Disappear, stay in front, or not get overtaken. And then some races are just exciting and others are not."